The wreckage of the Altalena, the legendary Irgun ship that was sunk by orders of Israel's first Prime Minister David Ben Gurion in June 1948, may have been located, Yedioth Ahronoth reported Friday. 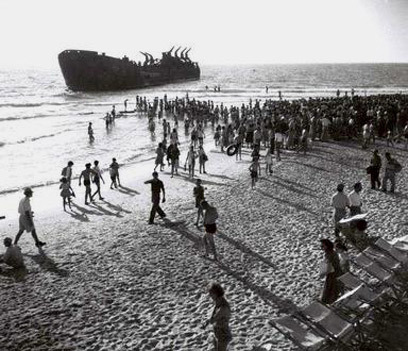 The Altalena was the scene of a bloody confrontation between the newly-formed IDF and the right-wing Jewish paramilitary group, which ended when Ben-Gurion instructed the IAF to sink the ship. Nineteen Irgun and IDF soldiers were killed in the operation. According to the report, a State-funded search for the wreckage has been able to make the first real progress in the case in years. Begin Center experts involved in the search found that the IDF's presumed coordinates for where the Altalena went down were wrong, adding that it is possible that they were falsified in an attempt to thwart future recovery attempts. The current search for the Altalena began after MK Yariv Levin (Likud), who was related to the ship's captain Eliyahu Lankin, petitioned Prime Minister Benjamin Netanyahu to try and locate the sunken vessel. Netanyahu granted the request and the Prime Minister's Office allotted NIS 200,000 (roughly $50,000) for the recovery efforts. Marine experts hired by the Begin Center based their original search on the Navy's coordinates of record, but could not find any sign of the ship. It was then decided to expand the search area. The first substantial hint as to the sunken ship's location was discovered soon after – an acoustic signatures which matches the Altalena, located 300 meters deep and several kilometers off Jaffa's shores. "It is now perfectly clear that the initial data was not true and, in fact, may have been deliberately falsified," Begin Center Director Herzl Makov said. "The acoustic signatures suggests that there is high probability that the wreckage is the Altalena, but more advanced equipment must be employed for a definite answer." The government is expected to hold a special session in the coming days to approve the expenses related to the use of more advanced equipment. Should the wreckage prove to be the lost Irgun vessel, the government will need to approve a budget for its recovery and restoration. "Locating the Altalena is of the utmost historic and educational importance and it is the repayment of the debt that the State of Israel owes the men who died on the ship," Levin said. See all talkbacks "Report: Altalena wreckage located "